THURSDAY, 14 JANUARY – Ten students from Universiti Malaysia Sabah (UMS) and Universiti Utara Malaysia (UUM) completed the UMS-UUM Mobility Programme yesterday. 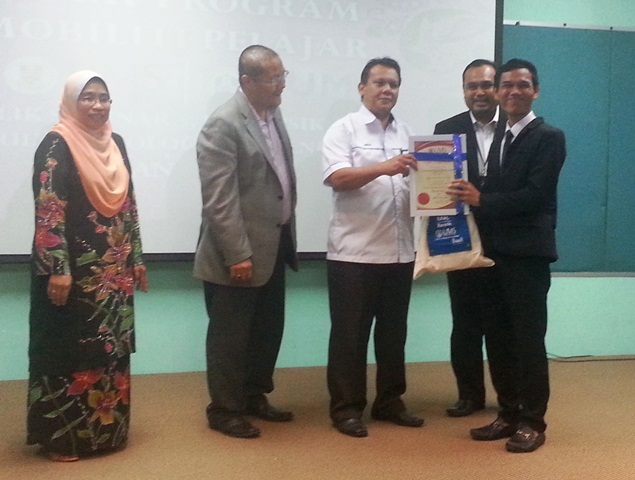 The students comprised of five students from UUM stayed at UMS Campus for one semester, whilst five students from the Faculty of Psychology and Education UMS were at UUM Campus, Kedah since last September. The students were feted at a ceremony held at the Seminar Room of the Faculty of Psychology and Education, which was also attended by the Deputy Vice-Chancellor, Associate Professor Dr. Ismail Ali. In his speech, Dr. Ismail praised the efforts and cooperation of the two universities to ensure that both parties benefited through this mobility programme. He further said, the programme would not only strengthen the academic field of both universities, but also provide opportunity to the participants to acquire knowledge that was not based purely on academic. “Those students who were involved indirectly became an ambassador of the university, allowing them to promote the uniqueness of the university and its culture throughout the programme.